Areas of Baggari heavily affected by the fighting are currently inaccessible by humanitarians. Humanitarian partners anticipate that many people likely scattered further into remote areas search of protection. 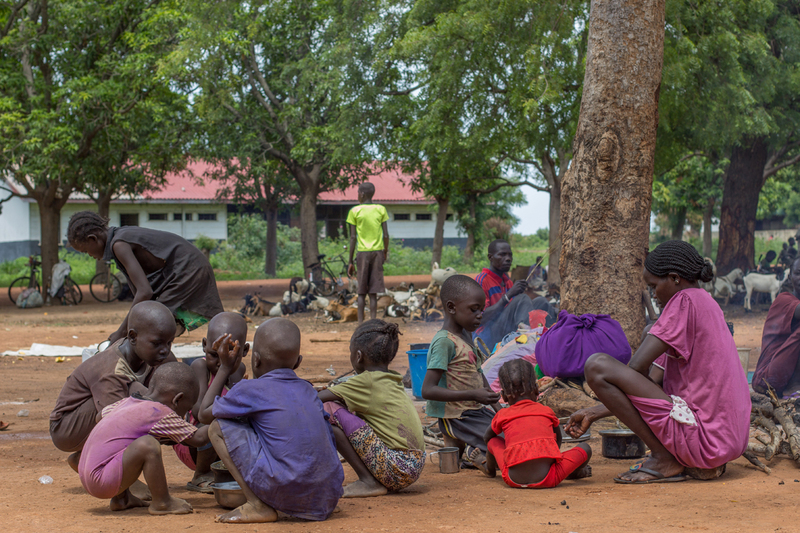 Camp management volunteers in Agok reported that families from Baggari have arrived at the site as recently as 3 July, likely crossing dangerous frontlines between the warring parties to reach Agok. IOM, as camp management lead in Wau, is supporting coordination of the response to the influx to Hai Masna and Agok. It also distributed soap to 1,170 people and menstrual hygiene kits to 300 women in Agok on 2 July and shelter items, such as blankets and sleeping matts, to 730 people in Hai Masna on 29 June. IOM began building communal shelters on 3 July in Hai Masna for the new arrivals who have been sleeping under trees since arriving. Wau: New arrivals shelter under trees and in abandoned buildings in Agok, Wau. IOM/McLaughlin 2018.